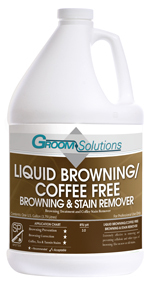 Liquid Browning/Coffee Free Browning Treatment and Coffee Stain Remover is specially formulated to effectively deal with two of the most problematic and common carpet issues – browning and coffee stains. This solution works extremely effectively on removing or preventing cellulosic and other types of browning that may occur on carpet or upholstery due to over-wetting, inappropriate use of high pH alkaline chemicals, improper drying, and cellulosic soiling. Liquid Browning/Coffee Free removes or reduces browning due to over wetting and bleed through of jute backing in carpets. Coffee and tea are two of the most common spots or stains on carpet and upholstery. Liquid Browning/Coffee Free was especially formulated to make the removal easier for the professional. It will attack both coffee and other tannin stains quickly and effectively. Tannin is naturally found in tea, and sometimes added to inks and dyes. This solution is effective on new or old stains.